I wrote a silly thing about Tiny Tower, but it is so long that we are splitting it up into three parts. 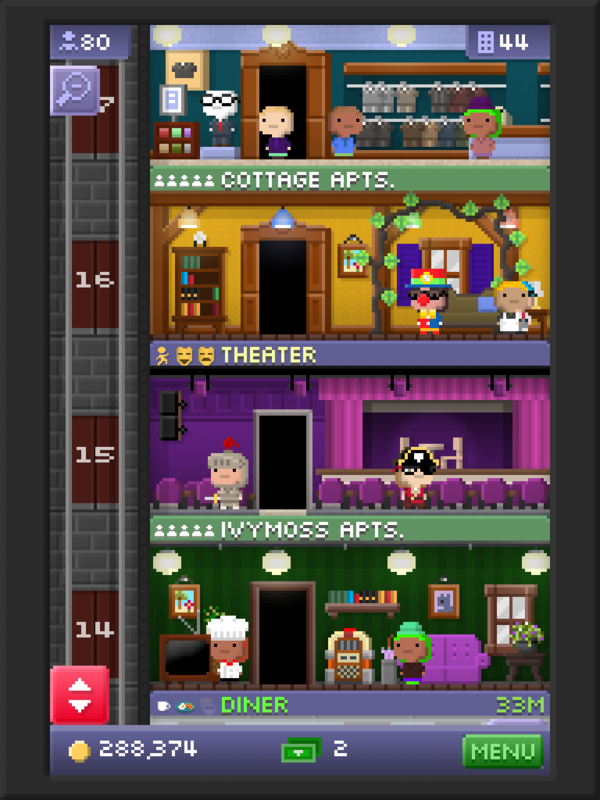 Nimblebit made Tiny Tower. I have played their game with the frogs; it certainly had frogs in it. I was hoping it would be a pet game, but it was more like a biology problem set with all the difficult test-crosses removed. There was some social stuff, too, but I ignored it. Tiny Tower is, apparently, what happens when you take a social game and remove the social from it almost entirely. You build this tower of tiny people. You are their boss. No one else can do anything to your tower. They can look at it and be jealous, if that is what they like. But you don’t have to acknowledge anyone else’s existence. You don’t have to think about anybody but yourself and your tiny people. And I like that, because I play games to be alone. The tiny people are called Bitizens. They have an appealing visual randomness to them. You re trying to get these little people to live in your tower and work at the businesses you build there. They have stats, so you could sit there and optimize them into the best possible tower loadout, if that’s your kind of thing. The better they like their jobs, the more profitable the business is. You are trying to get them into their ‘Dream Job,’ which gets you a bonus of ‘Tower Bux.’ Tower Bux are one of Tiny Tower’s two curencies– the one you can buy with real dollars. Because this game is a 1) free 2) a ‘social’ game, it 1) has two currencies and 2) is mainly a series of egg-timers. If you don’t want to wait for the tower floors to build themselves, you can speed the process up by paying Bux. Like any egg-timer game, Tiny Tower plays upon your desire for instant gratification, hoping to catch you in a moment of impatient weakness. Unlike most games of this kind, though, it doesn’t press you so hard for cash. Tower Bux are pretty easy to come by. And because it’s on my phone, waiting for the timers to tick isn’t so bad. I don’t have to think about whether I will be able to get online in time to harvest my crops, or whatever– the game is right there in my pocket, and nothing in Tiny Tower ever goes stale. Tiny Tower is a mobile social game with the social bits removed. It’s polite to me and doesn’t ask for my money very loudly. Its writing is amusing and its visual style is wholesome. It’s a mobile social game, but sometimes I almost mistake it for a regular old game. The world of Tiny Tower is either extremely heartening or extremely disheartening, depending on which bits of it you choose to ignore. It is either a communist utopia under a benevolent dictator (you), or a crushing capitalist mess under an exploitative monopolist (you). The businesses in Tiny Tower all pay their profits directly to you. It is your tower; presumably you own all the businesses in it. The people who live in the tower are all producers, not consumers; the patrons in the tower’s businesses do not live there, but magically teleport in to the floor of their choice. All that the workers do is work. They never buy anything, and they have no social differentiation. They pay you rent once a day, but no one knows what they do with the rest of their money, if they have any more of it. What’s going on here? 1) You are Tiny Tower’s capitalist overlord. All the stores visible in Tiny Tower are your company stores; all profits come straight to you. The Bitizens live like like nineteenth-century mill-workers, trapped under your thumb. They can’t move out, not even if you treat them poorly, give them bad jobs, or boss them around. They are probably your indentured servants; your desk is probably filled with their indentured contracts. You have locked these people into a cycle of debt, and they will never leave. Please, feel free to rub your hands together and cackle. 2) You are Tiny Tower’s communist dictator. You take the profits, give to each Bitizen according to its need, and administer the excess funds on the community’s behalf. You’ve eliminated all competition. You’ve eliminated all class. Everyone here is equal. Everyone has a clear-cut role in life. No one experiments or strikes out alone. Please, feel free to rub your hands together and cackle. But who, then, are the patrons? Who are these people coming in to buy from you? They tromp in through the doors, flapping their mouths open and shut. They’re consuming in a wildly capitalist fashion. They pay you money and march straight off the right side of the screen. Most of their purchases are luxury items, and most of these businesses are glamorous, upper-middle-class businesses– or gentrified versions of regular businesses. So, are we in a Scandinavian utopia? Is the player an omniscient, righteous Scandinavian government? Or is this tower a socialist commune in the heart of a capitalist city? Or is it a modern-day mill-town? Is this rent that the Bitizens are paying, or is it taxes? What’s going on? I don’t know what’s going on in Tiny Tower, and I have stopped caring. The game is about me. The Bitizens are my serfs. That’s the relationship we have. I can evict them if I want to. If their stats are low, I do. Let’s not give our relationship a label. I’ll just keep doing what I’m doing.